Use the high brightness vibrant and sharp LEDs to light up or create lights on your monitor, TV, or furniture. 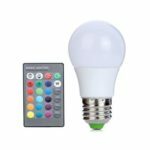 You can easily swap between colors and lighting modes using the 24-key remote controller. Add a subtle RGB LED light strip to your monitor, reducing eye fatigue and increasing perceived image clarity. 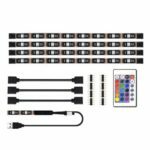 Includes 4 light strips, 3 light strip connectors, 24-key remote controller, an USB cable and 8 connect pins. Watching TV in the dark causes the eyes to constantly adjust between a bright screen and dark surrounding area. 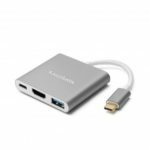 Add a subtle backlight to your monitor, TV, desktop, PC, reducing eyestrain caused by differences in picture brightness from scene to scene in movies, shows and games. It can also help make the grays and blacks on your screen seem richer. You can trim the TV backlight every 2 inches for perfect fit. Use the firm 3m adhesive to attach to almost any surface, provides secure and strong installation without worrying about falling off, flexible strips to bend to your desired positions. Comes with 24-key remote control, has 16 colors and 4 modes for you to choose. 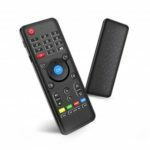 You can use the remote control to change color, the brightness as well as different lighting modes. The USB LED light strip is perfect for lighting and decoration solution for TV, computer, cabinet, bookshelf, closet, corner, holidays, Christmas decoration, etc.